Humans have inhabited the islands and coastlines of the Caribbean for millennia, leaving behind the legacies of great civilizations, conflicts, faith, and commerce. The Seven Manmade Wonders of the Caribbean include the remains of the great cities and temples of the Mayans, the still-thriving historic capitals of Cuba and Puerto Rico, fortresses and churches, and the Panama Canal. Recently added to the new list of New Seven Wonders of the World, the ruins at Chichen Itza on Mexico's Yucatan Peninsula stand as a lasting tribute to the great Mayan civilization that raised this sprawling city between 400 A.D. and about 1400 A.D. when it was suddenly and mysteriously abandoned. The Pyramid of Kukulkan is the most well-known and tallest structure at Chichen Itza, but the site also contains a grand plaza, marketplace, ball court, and an ossuary. The Tulum ruins are smaller but no less impressive: this walled port city is well-preserved partly because it was inhabited well into the 16th century. Tulum is a popular tourist site, combining ancient history with the beauty of the Caribbean coast just 80 miles south of ​Cancun. Located near La Romana in the Dominican Republic, the Basilica de Higuey is named for the spiritual mother of the Dominican order of nuns. The site of the church became a Catholic festival site after a victory by Dominican troops over the French army at the nearby Battle of Sabana in 1691, after which the victorious soldiers offered their arms in Higuey as a tribute to Our Lady of Altagracia. 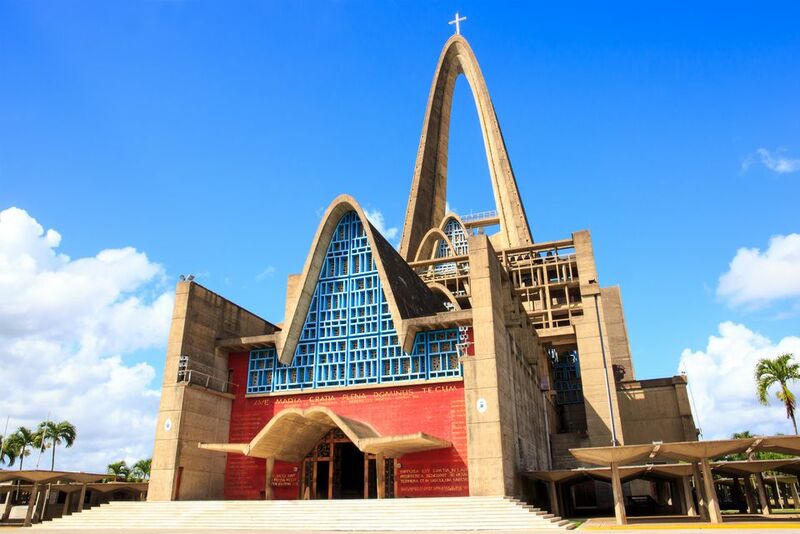 The Higuey Basilica itself is a modern structure, built in 1971 and located about 40 minutes from the resort area of Punta Cana. It is one of the most visited buildings in the Dominican Republic, and its signature 248-foot central arch and other architectural features are lit in bright colors at night. The Jan. 21 feast day draws a million Catholic pilgrims to Higuey each year. Linking the Pacific and the Atlantic oceans via the narrow isthmus of Panama and via the Caribbean Sea, the Panama Canal is a testament to human industriousness. Started in 1880, the canal took more than 30 years to complete and cost the lives of 22,000 workers. It has remained a key shipping conduit for more than a century, providing the only passage between the two great oceans other than circling Cape Horn. Today, about 40 cargo and cruise ships make the nine-hour passage through the 48-mile canal each day, passing through two sets of locks and 17 artificial lakes. Old Havana (La Habana Vieja), Cuba, recognized as a UNESCO World Heritage site, includes the ancient core of the port city founded in 1519. The historic district contains about 3,000 buildings, including old Spanish forts, the 1748 Cathedral of San Cristobal, and the famous Malecon seaside promenade and seawall on the city's north side. Many of Old Havana's baroque and neoclassical buildings have survived the centuries despite long neglect. Ernest Hemingway frequented Le Bodeguita del Medio bar in Old Havana, and visitors can still get a mojito or a Cristal beer there. Amid the cane fields and rainforests of St. Kitts rises the Brimstone Hill Fortress, perched on a massive 800-foot-high volcanic promontory near Sandy Point. Known as the "Gibraltar of the West Indies," the British fort was built between the 1690s and 1790s, its thick walls carved from black volcanic rock. Despite its commanding location and great strength, the fort was conquered by the French in 1782 but later reclaimed by the British under the Treaty of Versailles. After a period of neglect, this UNESCO World Heritage site was restored by the St. Kitts government and today is one of the island's most popular tourist destinations, offering sweeping views of the Caribbean Sea and nearby Nevis, Montserrat, Saba, St. Martin, and St. Barts. Haiti's Citadelle Laferrière is remarkable not just because of its size (the largest fortress in the Western Hemisphere) and mountaintop location but also because it was built not by a European army, but by Haitians determined to protect their new nation. The citadel, located atop a 3,000-foot mountain, was built between 1805 and 1820 and armed with 365 cannons. Although located well inland from the Haitian coast, the fort provides commanding views out to Cuba, located 90 miles across the Caribbean. With 130-foot walls, the citadel has become a symbol of Haitian national pride, and its location in the more peaceful northern part of the country allows access to tourists, who can hire guides in the town of Milot to visit the fort. The old city of San Juan, the capital of Puerto Rico is filled with wonderful historic buildings, but two stand out: the picture-postcard Fort San Felipe del Morro and La Fortaleza, the governor's mansion built between 1533 and 1540. Both UNESCO World Heritage sites, the two forts were built to defend the city from both European enemies of the Spanish inhabitants and the local Carib Indians. "El Morro" was started in 1539 and additions were made for the next 400 years; it saw action in battle against the English in the 1590s, the Dutch in the 1620s, and the U.S. in the 1890s. La Fortaleza is the oldest executive mansion in the New World and still in use today.